Canadian lovers of streaming TV rejoice, the best selling US, low cost Roku media boxes have arrived in Canada. 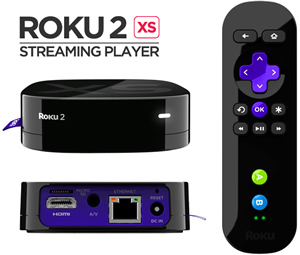 Roku which started life as the Netflix streamer, comes fully loaded with 100 channels of goodness running on the Roku 2 XS and Roku 2 XD. The two high end players launched today in Canada and can be pre-ordered for April 30. The launch is part of Roku’s planned International launch which started in the UK earlier this year. The Roku features 1080p HD and built-in WiFi, the XS also comes with a games remote and USB/Ethernet ports. The Roku has channels that stream movies and shows from companies like Netflix, Crackle, National Hockey League and Major League Baseball, Flickr, Facebook and TuneIn Radio amongst others and games such as Angry Birds. The number of channels will increase just like the US version, which currently has around 450 channels. Prices for the XD and XS Canadian internet TV box will be priced at CAD 89.99 and CAD 109.99, respectively. Availability is pre-ordering online from Roku.ca, Amazon.ca, LondonDrugs.com and Walmart.ca. Retail stores London Drugs and Walmart should have the boxes in stock by the months end.